Before buying any hose-related products, find informative answers here to some of the common questions asked. We're here to assist you in choosing the right product and accessories for all types of applications. Don't see the answer to the question you are looking for? Contact us today! How do I determine the right hose for my application? Using Eaton's exclusive two-tiered system, Paca Industrial has the capability to determine the appropriate hose for each application. Our system allows for a custom solution whether the requirement is to meet or exceed the expectation. Size: Specify the inside diameter needed. Temperature: Specify the temperature of the media. Application: Specify whether it will be Air, Fume, Dust and/or Materials going through the hose. Media: Specify the media that is going through the hose. What is Eaton’s two tier product system? Sometimes less is more. Focused products, smarter choices. Eaton is taking a new approach to helping you succeed by reducing the complexity of our hydraulics hose and fittings product offering, while developing new, more intuitive ways to help you find the right product fast. We know that your workforce demographics, regulatory environment and global economics require a new approach, and we’re proactively leading the charge with a smaller—but smarter—hydraulics offering to help you spend less time combing through product options and more time competing in expanded markets, improving responsiveness, and closing new business. Which hose accessories do my assemblies require? Depending on the application some hose assemblies will perform better with the addition of certain accessories. For example, applications exposed to high abrasion may benefit from an abrasion sleeve or a bend restrictor. These accessories can optimize the performance of the hydraulic hose assembly. What is an engineered system? At Paca, we define an engineered system as a combination of hydraulic components that work together collectively perform a useful function. We are able to provide you with a hydraulic systems with the necessary components to provide maximum efficiency and quality. An engineered hose assembly system will provide the user with a warranty against covering manufacturing defects. Are carbon steel adapters part of Eaton’s engineered system? Eaton hydraulic components whether they are hose, hose ends and adapters are part of our complete engineered system. A warranty is an assurance by Paca and Eaton Weatherhead to our customers that specific facts or conditions are true or will happen. It's a statement made by the manufacturer of our hydraulic systems stating that it will perform in the way specified. How do I find out which hoses are compatible with which fluids? It is mandatory to consult a compatibility chart to check that the tube compound is compatible with the fluid used in the system. Elevated temperature, fluid contamination, and concentration will affect the chemical compatibility of the tube and fluid. Most hydraulic hoses are compatible with petroleum-based oils. Note that new readily biodegradeable or green fluids may present a problem for some hoses. A fluid compatibility chart can be found inside Eaton Weatherhead’s master catalogue or by contacting Paca. What’s the difference between SAE and EN specs? SAE stands for the Society of Automotive Engineers and has been the generally accepted standard in the North American fluid conveyance market for several decades. It is based on construction technique and material of hydraulic hose. EN is a more recent standard used in Europe and has similar parameters to the SAE criteria. What’s the difference between crimped fittings and field attachable? Our in house experts can use crimped on fittings or provide you with field attachable fittings. On a crimped fitting, the connection is reached by pushing the outer sleeve of the fitting to the end of a hydraulic house. This forms a solid and permanent connection to the hose end. 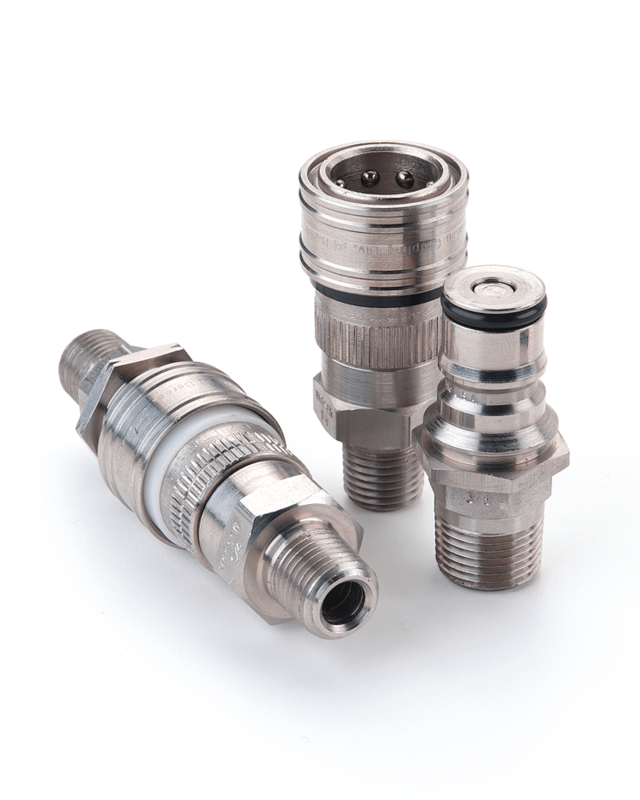 Field attachable fittings consist of two pieces: the insert and the socket, or collar. The insert has machined threads along the outer diameter, which engage the socket during assembly. The socket has deep-tapped inner threads, which allow the hose cover to expand so that sharp lead threads can cut a spiral path into the hose jacket. Following the lead threads are spaced blunt threads that fill with the outer rubber cover of the hose during assembly. A field attachable fitting can be reused. What are the advantages of flexible hydraulic lines compared to rigid tubing? The benefits of flexible hose over rigid pipe and tubing is that flexible hose is simple to route, withstands vibration and thermal expansion or contraction. Should I crimp my hoses in-house or purchase pre-made assemblies in “kit form”? This can depend on a number of factors but Paca can outfit your operation with either an in house solution or provide pre-made assemblies in kit form. What are my options for crimping equipment? Eaton Weatherhead provides crimping machines for any hydraulic application. We would be more than happy to assist you with selecting the right machine to fit your needs. Is there training available for equipment if I choose to crimp in-house? Absolutely. One of our experts can provide you with detailed training sessions for you and your team members to help you become a master crimper in no time. Where do my customers go to replace a hose assembly if a failure occurs? Visit our Kitchener “Port-to-Port” hose assembly counter for immediate in person service. Not local? No problem! Paca can ship your required assemblies to anywhere in Canada! Or you may use Eaton’s distributor locator to find a distributor location near you. How do I determine if my customers require Eaton LifeSense smart hose technology? Great question! Have you ever experienced a hose failure which lead to costly downtime and expensive maintenance fees? Eaton’s LifeSense technology is for you. LifeSense provides real time hose monitoring to accurately predict the life of a hydraulic hose before it fails. Combining this technology with Eaton’s UniqID system, you can have a hose delivered to your location before the failure of the hose. Eliminate the downtime and keep production running. Are there any other types of hose that I need to consider for my system? Absolutely. Weatherhead provides a wide array of hydraulic and industrial hose catered to your requirements. Our experts can assist you in determining what you need for maximum benefit. How are hose assemblies cleaned to ensure contamination is prevented? Reduce downtime, extend filter life, reduce the risk of failure and premature wear due to contamination with Eaton's new Hydraulic Hose Cleaning Systems. Available in both a hand-held launcher and bench mount launcher to shoot projectiles through hose, tube or pipe assemblies, ensuring contaminants are thoroughly removed prior to final assembly. Are labels available for hose assemblies? Eaton’s UniqID tool was created to label, manage and track Eaton products so they can be maintained, repaired and replaced quickly and accurately. Why would I want to track hose assemblies after they enter the field? Eaton’s UniqID system allows end users catalogues the specific details of each hose assembly to enable exact replications of the asset in the event of failure or need for replacement. How does Eaton Weatherhead compare to “off-shore” brands that have entered the market? Well any hydraulic hose entering the north american market must meet SAE or EN standards, all Eaton fluid conveyance products exceeds those standards and uses industry leading manufacturing processes, construction materials and vigorous testing methods. These features along with Eaton’s manufacturing warranty provides users with unparalleled confidence in their hydraulic applications. What geographic region does Paca service? Paca Industrial serves customers across the entire Canadian marketplace. How long will it take to receive my order of pre-made assemblies? Paca can work with you to meet tight deadlines, rush requests and unforeseen circumstances. We have the largest inventory of Weatherhead product in Canada and we will continue to grow to serve current and future customers alike. Will Paca help recommend the proper product for my application? You bet. We pride ourselves on our expertise and engineered systems. At the beginning of any new relationship with Paca we perform a comprehensive audit of your requirements and may recommend products different from what you have sourced in the past. Which industries does Eaton Weatherhead serve? We currently serve agriculture, mining, automotive, construction and more! If you require a hose, Paca has what you’re looking for. Generally speaking can serve any industry that relies on a fluid conveyance product. Which type of hose end provides the best connection/seal? Eaton’s FOR-SEAL technology offers the industry’s best option for connection of seal. What’s the difference between working pressure and burst pressure? The working pressure is the highest amount of pressure that the hose assembly will operate under, including spikes. It must be accounted for and never guessed or assumed. The burst pressure for a hydraulic hose is what Eaton offers as the maximum pressure before a particular hose will generally fail. Different hoses and hose styles will have different burst pressures. Generally speaking, hydraulic hose has a 4:1 burst pressure. Are bend radius and flexibility the same thing? The minimum bend radius represents the smallest diameter that a looped hose can achieve without damage and is measured as the distance to the inside edge of the hose when making a 90-degree bend. The flexibility of hose enables components to be positioned in the most efficient or convenient places, because the hose has the ability to bend around corners, through tight spaces, or across long distances. Does hydraulic hose have a shelf life? Society of Automotive Engineers (SAE) specifications state the shelf life of bulk rubber hose is 10 years from the date of manufacture and is considered unlimited for thermoplastic hose, if stored in subdued light and controlled temperatures with no fittings attached. How should I store my pre-made assemblies and/or bulk product? Rubber hose products in storage can be affected adversely by temperature ,humidity, ozone, sunlight, oils, solvents, corrosive liquids and fumes, insects, rodents and radioactive materials. The appropriate method for storing hose depends to a great extent on its size (diameter and length), the quantity to be stored, and the way in which it is packaged. Hose should not be piled or stacked to such an extent that the weight of the stack creates distortions on the lengths stored at the bottom. Whenever feasible, rubber hose products should be stored in their original shipping containers, especially when such containers are wooden crates or cardboard cartons which provide some protection against the deteriorating effects of oils, solvents, and corrosive liquids; shipping containers also afford some protection against ozone and sunlight. What are the primary reasons for hose failure? Hoses are not stationary – they will contract or stretch as the pressure within them changes. When hoses rub against objects, including other hoses but especially metal edges, this can result in abrasion. Abrasion is a very common cause of hydraulic hose failure and occurs when the outer cover of a hose is worn away to the point of exposing the reinforcing steel wires. This can eventually result in leaks. Another major cause of hydraulic hose failure is poor routing. Avoid routing a hose through a potentially abrasive area or a pivot point. Do not route hoses through high temperature areas unless there is no alternative. Pay close attention that the minimum bend radius is met to avoid buckling, kinks, and failure. When hoses are exposed to extreme temperatures, they begin to lose their flexibility and stiffen. High temperatures cause the plasticizers in the elastomeric inner tube to break down, which then hardens and begins to crack. As time goes by, those cracks can eventually reach the outside of the hose. If you remove a hose and it makes a cracking sound when you bend it or if it remains in a bent shape, then the problem is heat aging. Internal tube erosion is typically caused by concentrated high velocity streams of fluids (possibly with the presence of particles) that gradually erode the inner tube of the hose. As the erosion continues, an external leak can develop. Another common area of hydraulic hose failure occurs at the fitting where the hose and crimp seal meet. This is usually caused by the hose being bent too closely to the actual fitting due to poor routing or the weight of the hose itself. Not all fluids and hydraulic hoses are compatible. If an incompatible fluid is used with an otherwise excellent quality hose, it can cause the hose to begin to disintegrate from the inside, swell, and delaminate. If the hose disintegrates and leaks, serious particulate contamination to the hydraulic system can occur. Improper assembly is another cause of hydraulic hose failure. When the hoses are cut to size, they must be carefully cleaned and flushed to prevent contamination by abrasive debris that is left behind. The inner tube should be as clean as possible, and the ends of the hoses should be clamped after the fittings have been crimped into place. How do I determine thread type? A wide variety of types of threads are used on components like fittings, filters, valves, manifolds, connectors, quick couplings, purifiers, regulators and instrumentation. When choosing the right components for your application it is essential to order the right type of thread and think of the compatibility of the connection made. We have send out a small batch of testing tool kits to our customers which contains a thread gauge for measuring metric and whitworth thread and a small booklet to get you started. Determine if the thread is straight (parallel) or tapered. The thread is tapered if the diameter increases or decreases. If all the diameter stays the same, the thread is straight (parallel). Tapered thread (BSPT and NPT). Straight thread (BSPP and metric). Measure the thread diameter. Measure the thread diameter using a caliper to determine the diameter and measure on the thread tops. For tapered thread: measure on the 4th or 5th full thread. For straight thread: measure on any full thread corridor. Determine the number of threads per inch (TPI) or the pitch (metric threads) with the thread gauge. Use the Teesing thread gauge to determine the pitch or the TPI.The pitch is indicated in metric thread in millimeters, withworth thread is indicated in the number of threads per inch. Locate the possible TPI or pitch by matching the found diameter with the thread tables below. How does Paca Industrial differentiate from other hydraulic “distributors”? Paca Industrial is not your typical hydraulic distributor. We have formed a direct partnership with Eaton Weatherhead. This gives us the ability to stock a wide array of Weatherhead hydraulic components in our large Kitchener warehouse. Stop by at anytime. We would love to give you a tour of our operation. Copyright © 2019 Paca Industrial. All rights reserved.